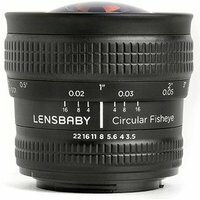 The Lensbaby 5.8mm, 185° Circular Fisheye lets you experiment with extreme perspectives. The ability to focus 1/4 inch in front of the lens provides an extraordinary way to explore macro photography. Get close enough to a flower to nearly touch it - while capturing the entire garden surrounding it in the frame. The lens has a polished interior barrel that creates unique flare when pointed at a light source or reflects the edges of your scene around the image. There is no electronic communication between the lens and the camera body. Optimised for Sony A-mount DSLRs with an APS-C sensor and produces a smaller image circle on full frame.